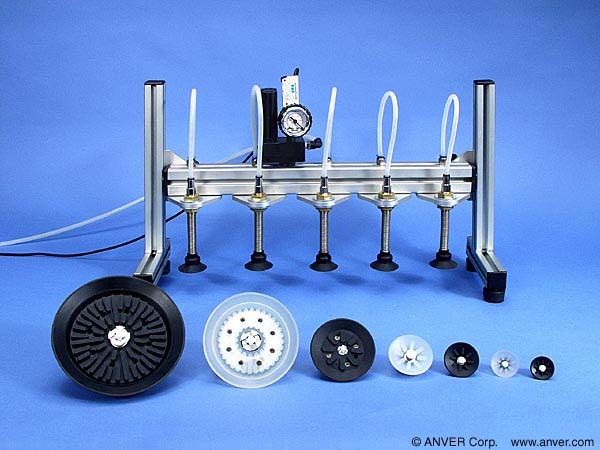 A new line of flat rubber suction cups that feature probe valves which provide faster attach and release and conserve vacuum is being introduced by ANVER Corporation of Hudson, Massachusetts. ANVER Flat Suction Sensor Cups have a probe which contacts the surface of the object being picked up and opens a valve to instantly provide vacuum. Featuring faster attach and release by maintaining a vacuum right to each cup, these flat suction cups reduce air consumption by preventing leakage from cups that missed the object being picked up or aren’t being used. Available in 10 sizes from 1.26″ (30mm) to 5.98″ (150mm) O.D., ANVER Flat Suction Sensor Cups are molded from rubber and have plastic or metal probes, depending upon size. They are ideal for packaging and printing applications where several cups are connected together in a single system.